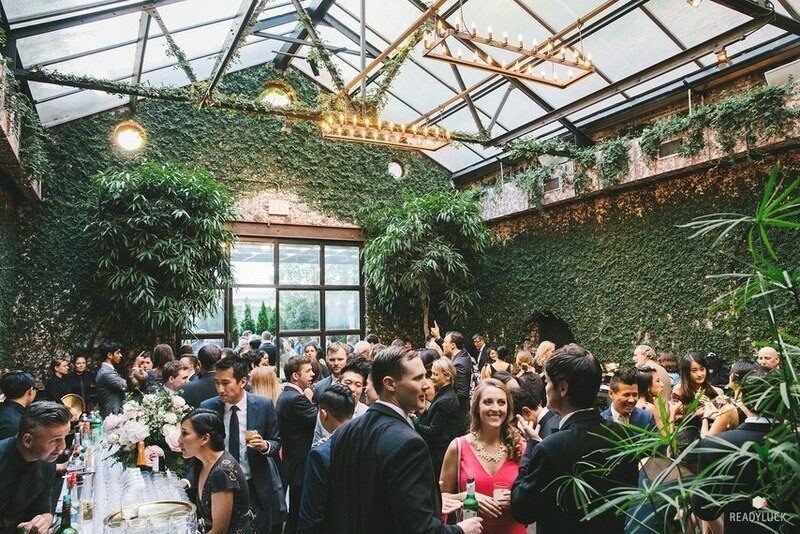 For their June 2, 2017, wedding, the New Yorkers looked outside the city to find their dream venue. 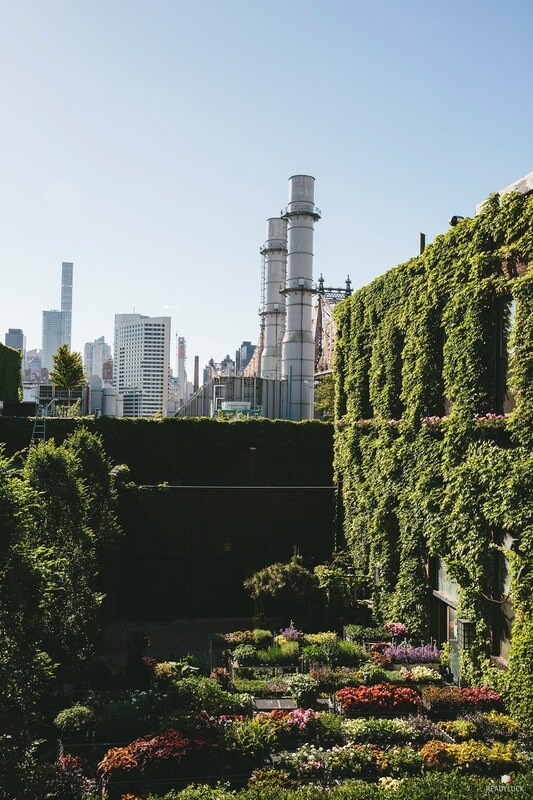 They found it across the East River, at the Foundry, an industrial warehouse and adjoining garden, in Long Island City. “We liked that the space spoke for itself and didn’t need much sprucing,” Emily says. 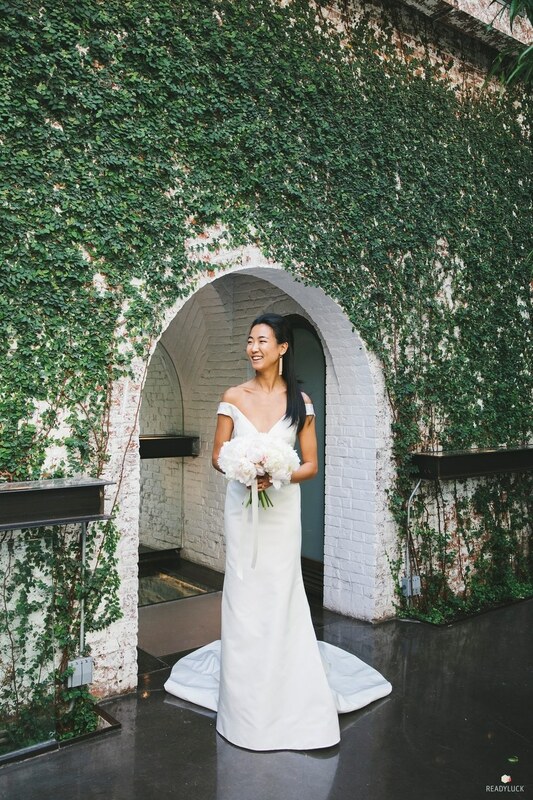 “We also really liked that it had an indoor/outdoor component and guests could spill outside during cocktail hour and enjoy dinner under the stars.” Emily and Eric were on the same page with their “minimalist meets modern meets classic” vision and attacked planning together. “I really appreciated that Eric was fairly involved in the process with me,” she says. 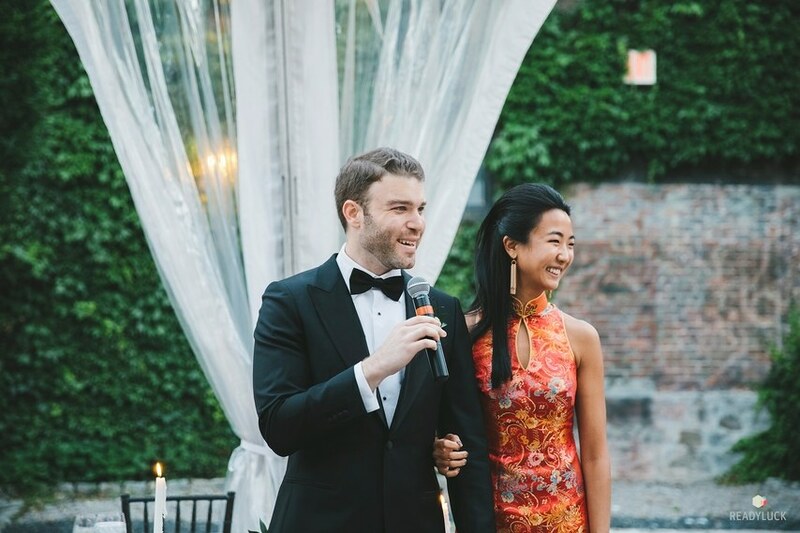 “It was nice to have a true partner throughout it all instead of having to make decisions by yourself.” From there, the couple personalized their day to represent their respective Jewish and Chinese cultures—with a chuppah and breaking of the glass for Eric and a traditional qipao gown and bowing toast for Emily. 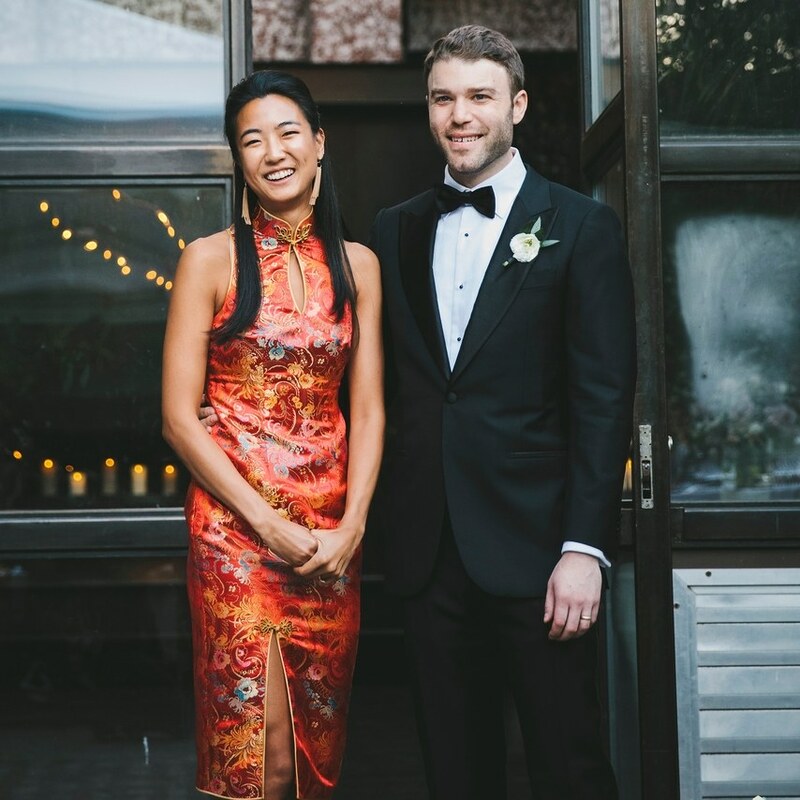 Keep reading to see more of Emily and Eric’s indoor-outdoor garden party (with cultural touches!) at the Foundry in Long Island City. 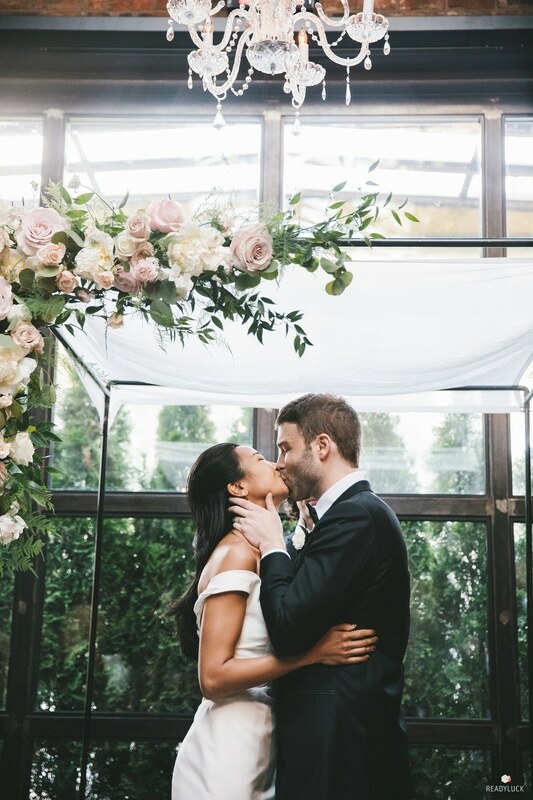 It’s safe to say that Edward Winter of Readyluck captured their dream day to perfection! 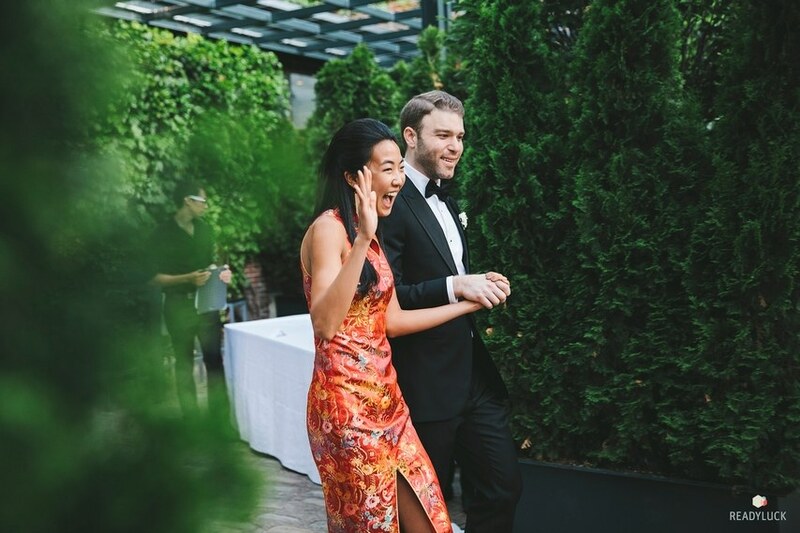 The couple fell hard for the Foundry’s warehouse setting, outdoor garden, and New York City views. 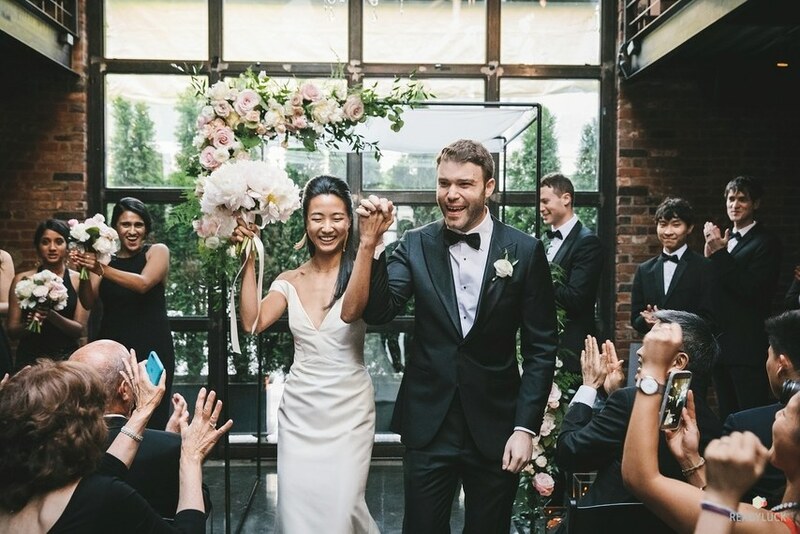 “We wanted something that wasn’t just another Brooklyn warehouse, but it wasn’t a sterile ballroom either,” explains Emily. 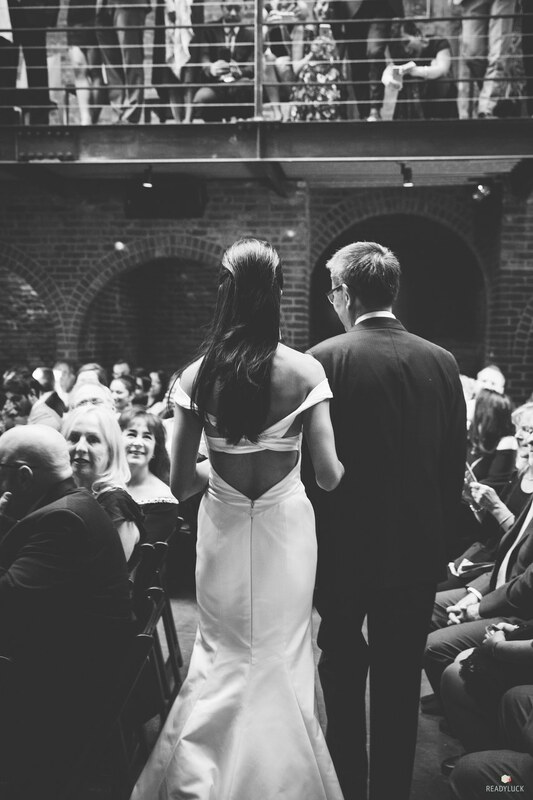 The bride went into dress shopping knowing what she didn’t want: lace, beading, and strapless. “I know my own style pretty well, and I knew I wanted something that was clean and minimalist,” she says. And she did find her dream dress fairly easily! 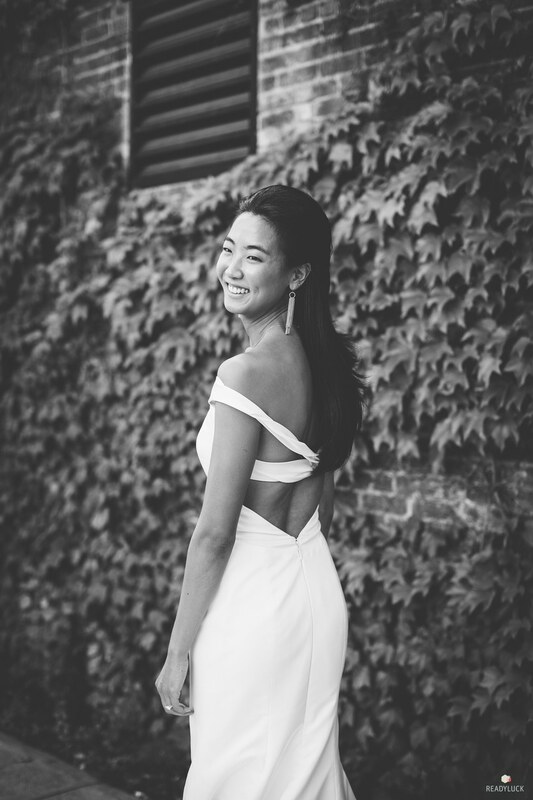 Emily tried on her off-the-shoulder gown by Austin Scarlett at her very first appointment and couldn’t get it out of her mind, even though she continued her search at other salons. “I knew it was the One,” she says. 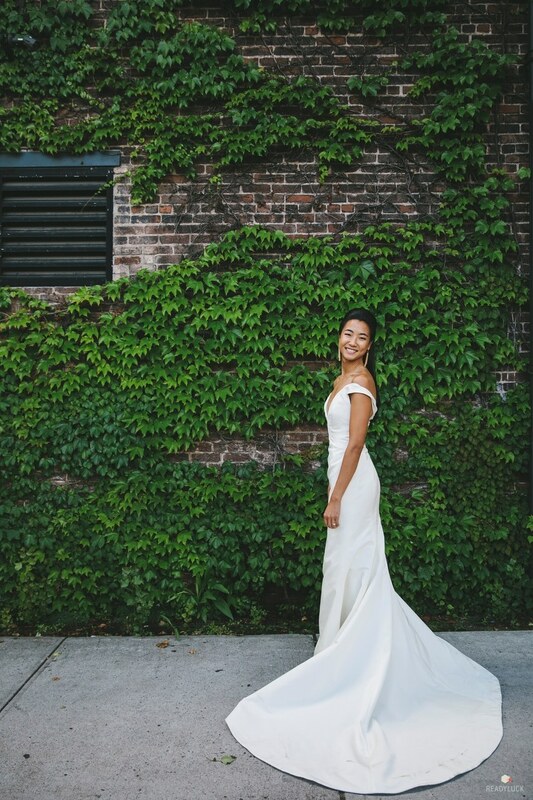 While Emily admits that her favorite part of her wedding dress was its “simplicity and no-frills look,” we’d make a strong argument in favor of the statement back. Seriously stunning! 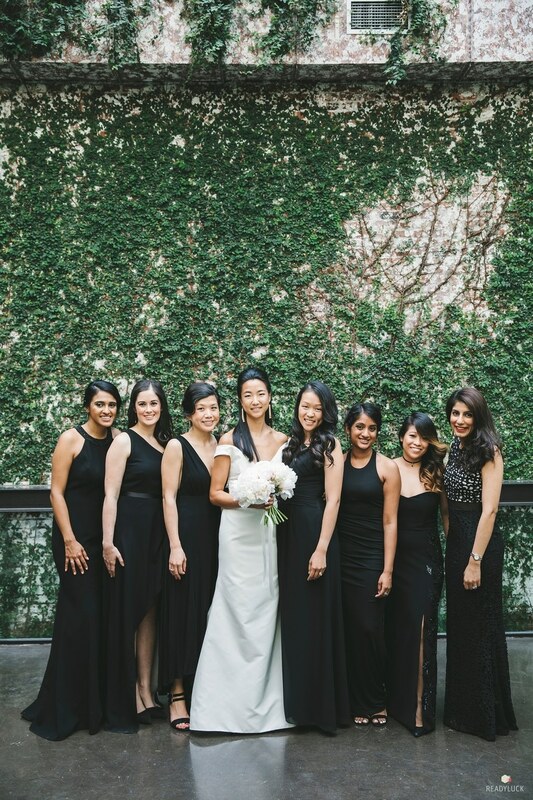 The bride let her bridesmaids select their own dresses, with the only rules being that it had to be black and floor length. “They all really came together in the end, and each dress really reflected the style and personality of each girl,” says the happy bride. Emily made her grand ceremony entrance on the arm of her father. 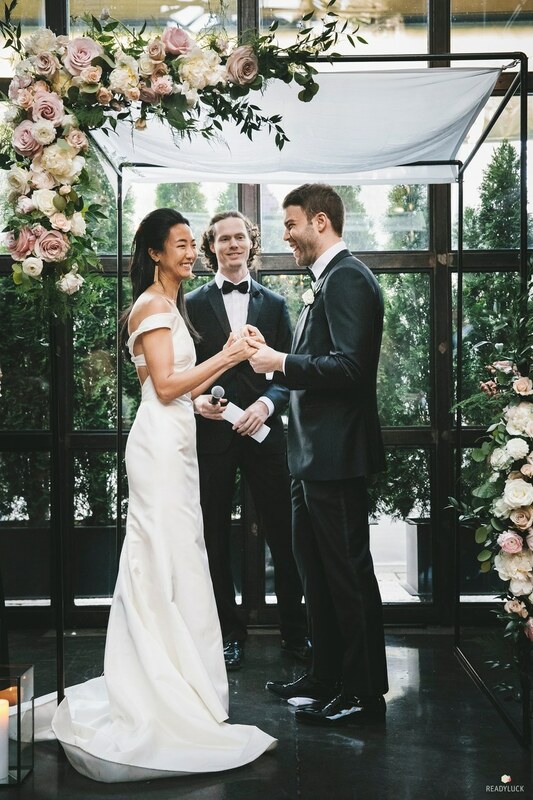 The bride and groom exchanged vows under a floral-covered chuppah, as Eric’s best friend from childhood officiated. For the reception decor, Emily and Eric stuck to their original vision. 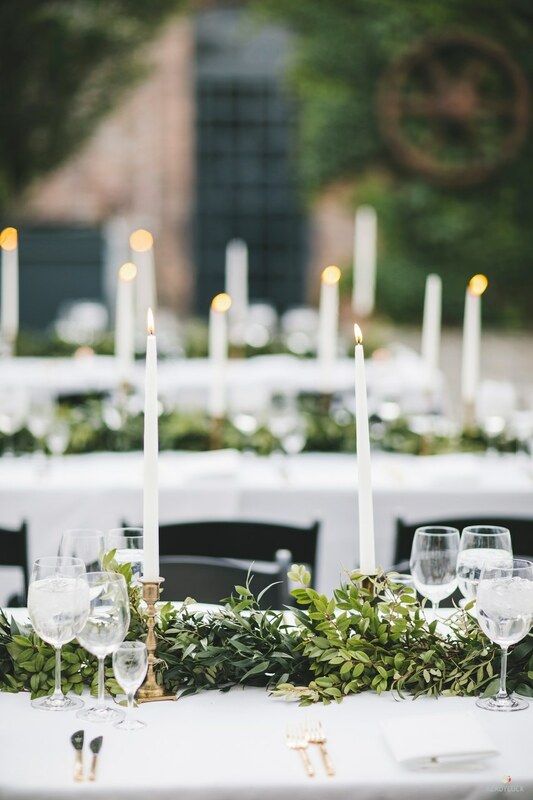 White-covered tables were topped with elegant gold candelabras, greenery garlands, and black-and-gold tableware. 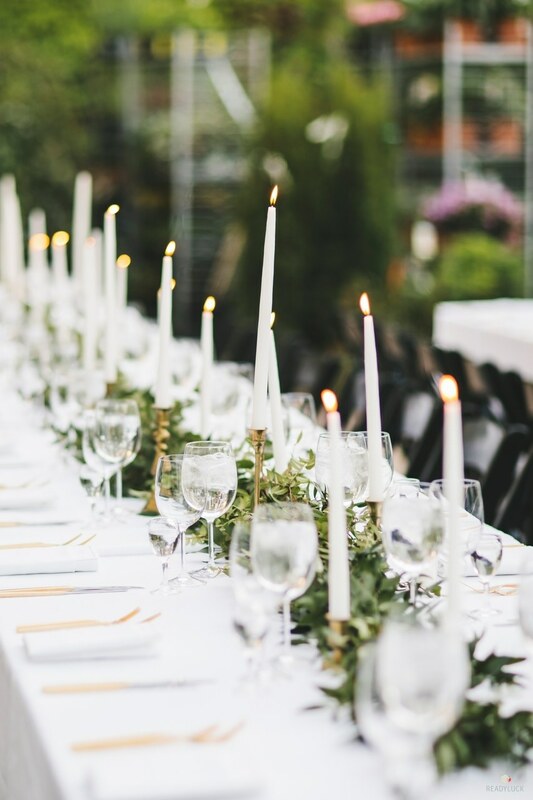 “I really liked the black-plate-with-gold-silverware combo; it was very simple and modern,” says Emily. The couple got creative with money-saving hacks by ordering their table numbers on Amazon and having a friend (who’s a graphic designer) mock up their paper products. 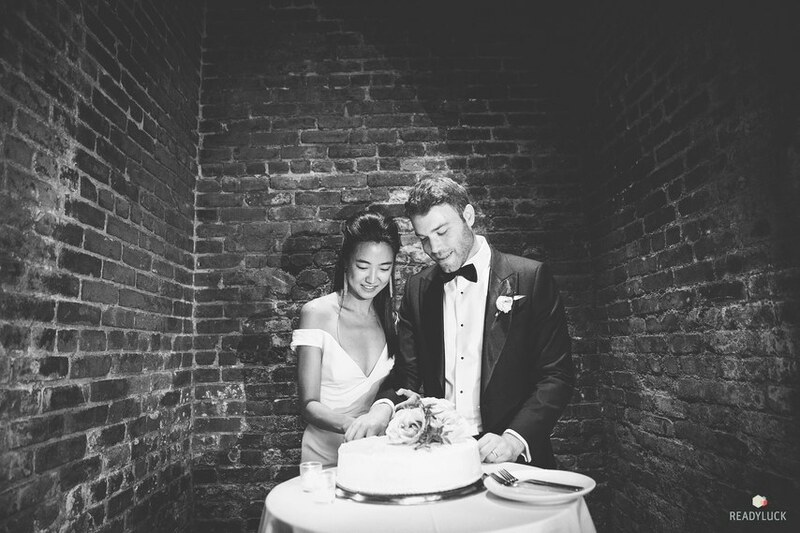 The couple ended the night by cutting into a carrot cake from Lloyd’s on the Upper East Side—but that wasn’t the only cake of the night! “We had a red-velvet cake as a birthday cake, as it just so happens that three of my college friends had birthdays on or around our wedding day,” Emily says.